There is a lot of material on the Internet over Hindu Philosophy. Google up the word, Hindu and you would find scores of web pages dedicated to it. However, there is no Primer or a Ready Reckoner available which will immediately help you in gaining an understanding about this topic. As a practicing Hindu myself, I had only an inkling and I freely confess that I did not possess much knowledge over the matter. One thing which always added to my confusion there are so many gods and goddesses in our Pantheon! There was no single source of truth. I am sure, many of you will share this consternation with me. 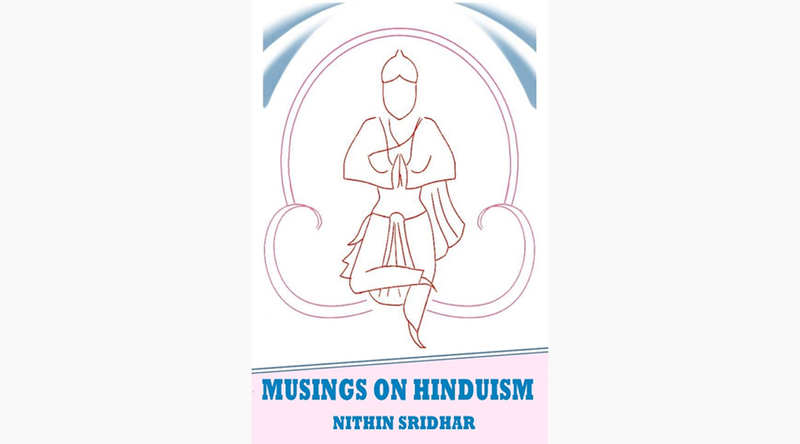 After reading Nithin Shridhar’s book, Musings on Hinduism, I can claim that although it has not given me profound knowledge, but it has certainly made my mind more appreciative of the underlying thoughts and principles. Nithin is a Civil Engineer by profession although he left it two years back to become a journalist. He is a full time editor at http://indiafacts.org/. Nithin writes passionately about spirituality, politics, social issues and religion. Nithin recently requested me to write a review on his latest book, Musings on Hinduism. I started the book with a blank slate, eager to know Nithin’s point of view and with a desire to learn as much as I could. The experience has been very rewarding, to say the least and I am very glad to have read it. A traditional book- review will not be able to do justice to Musings on Hinduism. I have tried an alternate tack I have tried to present highlights of the Hindu philosophy itself, captured from Nithin’s book. Wish me well, reader, since the path is a difficult one! Christianity is the most followed religion on Earth with an estimated 2.4 Billion followers. Islam is the second largest with 1.8 Billion followers. These two religions have one thing in common they believe in a single apostle, one person who is the ultimate source of truth. Practitioners of these religions have for long indicated their total disdain of Hinduism believing that Hinduism is nothing more than a pagan or primitive form of religion with a proclivity for idol worship. They are wrong, of-course. Hinduism is a branch of studies, it is a way of life which simply can’t be explained in digital terms. It is definitely not as regressive as portrayed by certain western/ leftist/ Liberal leaning intellectuals. Hinduism transcends deeper than that. Hinduism lays stress on the individual’s journey towards the truth instead of focusing on one God or one Prophet. Why is Hinduism at a disadvantage? It is perhaps because its philosophies are not that well documented. A lot of it knowledge is canonical and hence, it lends to misinterpretation. Here is where, Nithin’s book comes in handy. It presents to the reader in a simplified form, all the relevant concepts of Hinduism in a compressed format which is easy to digest. Below is the Saar of the book for your consumption. 1) Nithin currently writes and edits articles at India facts where he serves as an editor. I highly recommend following this blog. This blog will give you a full sense of the work and research Nithing has been pursuing about Hinduism. 2) Hinduism states that every person in their life is in the pursuit of or Happiness. Every person can either desire happiness in the form of material things like money, success, career etc this is sensory. Alternatively, he can also turn away from the sensory and to be in search of the everlasting bliss. The former path is the Pravritti Marga, the latter is called the Nivritti Marga.. There are two types of actions Sakaama and Nishakaama. This concept brings out the fact and our approach towards doing things and asks the question- Will we approach an action without an eye towards the fruit or with zero expectation? 3) There are four Purusharthas [Guiding Tenets] of life Karma, Artha, Dharma and Moksha You may have guessed it by now, the preference of the man in the Pravritti Marga, and those of the one in the Nivritti Marga? 5) Devotion is a concept which has found a mention in Christianity and Islam. Its manifestation is through prayers, through Namaaz or through Pooja. Bhakti in Hinduism is compared to Love but not just any love. It is a love which exceeds all sensory perceptions. Devotion or Bhakti are classified into Para Bhakti [The Devotion without any discrimination] and Apara Bhakti The Devotion which does make some discrimination].Both these forms of devotion are instrumental in getting Moksha or enlightenment. 6) Maya and Lila are two complementary and tough subjects to explain. Leela means play and Maya means the creative magic power. Very coarsely put, a magician’s hypnosis spell may be referred to as Maya and the effects that come out of it may be referred to as Leela. In the singularity concept [Paramarika State], we are all part of the Maya of the Supreme Being and his play is the Leela. This realization can be considered to be one step closer towards attaining Moksha. 7) Hinduism has the largest bank of knowledge ever to Man the Vedas. The Vedas are divided into 4 parts Rigeveda, Atharvaveda, Yajurveda and Samveda. 8) The six deadly sins Kaam, Krodha, Lobha, Moha, Mad and Matsar have been described in great detail in the Hindu philosophy. The one who conquers all these deadly sins is on the path to enlightenment or Moksha. 9) Tantra is a very important field of study. It is just unjustly compared to quackery by Western scientists, who do not have any background about it. Tantra is in fact a science which consists of different practices all towards understanding the Divine Truth. 10) The most well known contribution of Hinduism is the Kamasutra. Earlier, I talked about Kama as being one of the guiding tenets of one’s life. Kamasutra can very well be called as the encyclopedia for human sexual behavior. The very Western intelligentsia which abhors Tantra, laps up Kamasutra since it suits their hypocritical sensibilities. Nithin delves into an important topic, Sadhana quite deeply in the book. As I have been stating before, Hinduism lays emphasis on the journey towards the truth, Sadhana is that journey which takes you close to your spiritual objective. Sadhana manifests into many forms for example a Yogi may leave a Spartan life and wish to attain the highest knowledge in his life. An honest person would want to walk the path of truth his whole life. Both are forms of Sadhana. The importance of rituals in our lives is also discussed in details in the book. One more important topic in the book is of Satya or Truth. In Hinduism, Satya is contextual, it is subjective. In the Vedas, the meaning of the word Satya evolves into an ethical concept. It defines the moral compass of a human being. Dharma signifies behaviors that constitute duties, rights, laws, conducts and virtues and the right way of living. The opposite of Dharma is Adharma which is the exact opposite of Dharma. The book finally expresses some regret [Rightfully so] about the rising cases of Adharma in our society increase in rapes, corruption and crass opportunism and posits that the problems in our society will vanish, if people followed Dharma an optimism, that I have to share, if we want to dream of a better India. There are a lot of concepts in this book, which are definitely very interesting and make you want to explore. The possibilities are endless, it will take us most of our life-times if we want to gain deeper insights. So, if you want to start your journey in this great Ocean, Nithin’s book is the right step towards it. This book is highly recommended!